First, thank you SO MUCH for all of the kind words that you've sent me about my book here on my blog, on Twitter, and over on Flickr. After working on the book for such a long time, it's incredibly rewarding to hear all of your thoughts on it. Oh, and guess what? Jeni has already made something from one of the book's patterns (Kaye's wonderful advent calendar pattern). Go check it out on her blog! I've been on a bit of a tear lately completing quilt tops, but first I want to share a quilt from my book. I named this quilt "Christmas in the City", and I'd call it a non-traditional holiday quilt. Rather than using reds and greens, I used purple, teal, and aqua, which I think can be considered secondary Christmas colors. You see, I grew up in New York City, and my childhood memories of the Christmas season are comprised of scenes of chilly nights at Rockefeller Center and Times Square, and shopping trips with my grandmother to FAO Schwartz and 5th Avenue. My quilt made primarily of prints from Jay McCarroll's Habitat line, along with two different shades of purple shot cottons. All of the circles and dots remind me of blinking city lights and, while making it, I kept thinking that this would be the perfect Christmas quilt for a downtown loft. 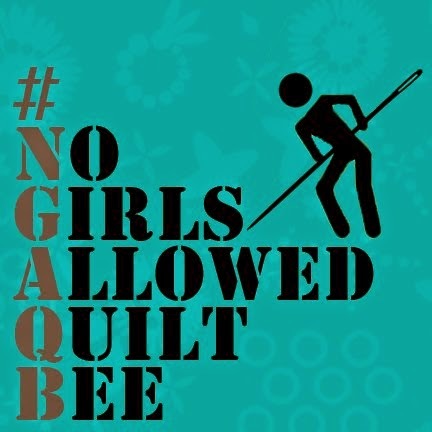 This next quilt top was assembled from blocks made for me by members of the bee inspired virtual quilting bee. The blocks are made from one of my favorite collections -- Joel Dewberry's Deer Valley -- and I asked my fellow quilters to follow Bonnie Hunter of Quiltville's pattern for Pineapple Blossom blocks. I bordered the top with two shades of Moda Grunge. Recently, my friend Thomas Knauer sent me some bits and pieces of his fabulous new collection for Andover Fabrics, Pear Tree. I love the colors of this line and wanted to make those bits and pieces stretch as far as they could. I decided on a fun Sweetwater pattern called Make Life ... Fresh and (again) added two borders of Moda Grunge. I love how the prints look like rows of bunting flags laid across the quilt top. My final quilt for the blog tour is this next top, which I made primarily from the quilt block I designed for Quiltmaker's 100 Blocks magazine (you can read more about my block here.) As you can see, I chose to orient my blocks differently than the way it was photographed for the magazine. I again used the Olympus line by Clothworks, which resulted in a quilt with more of a Japanese feel than I would typically be drawn to, but I do like its bold and masculine nature. I'll be back to share more pictures when I get all of these quilt tops finished up. I hope you enjoyed this stop on the blog tour! The next stop is with the fabulous Heather Jones over at her blog, olive and ollie. Be sure to head over and check out her amazing quilts ... and tell her I said "hi"! And to show my appreciation for checking out my quilts today, I'm offering a prize pack of some Moda Fabrics to one lucky reader. Simply leave a comment below and let me know which of my blog tour quilts is your favorite, and I'll randomly select a winner next week. Good luck, and thanks for stopping by! Love "Christmas in the City." It's been so inspiring seeing different interpretations of that fabric collection. Love that "Christmas in the City". The fabrics, the design, and the great quilting, all work together to make it my favorite. I love the "Christmas in the City!" absolutely gorgeous! 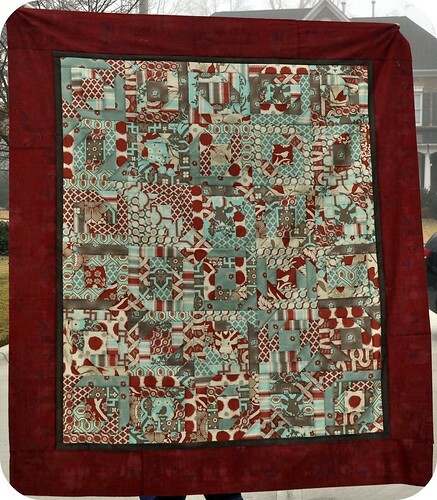 I love the red/black/gray quilt from your 100 Quiltmaker block. Of course being from GA and a UGA fam I love anything red and black! Beautiful quilts. Thank you for sharing. 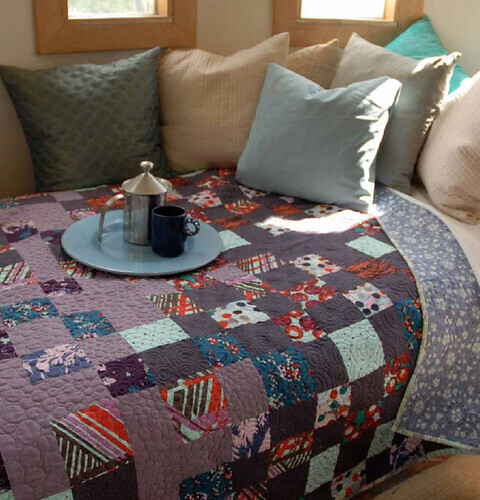 I love the quilt from your 100 Quiltmaker block. This is a boldly beautiful quilt. I love the Make Life Fresh quilt and the Quiltmaker block quilt. They are totally different but striking in their own ways. Thanks for the show! Love the Make Life Fresh quilt. The others are awesome too! You weren't kidding about being on a tear! The Pear Tree quilt is my favorite. Oh, I love Christmas in the City - maybe it's 'cause I live in a big city? btw....I often look at the little doll quilt in my front hall and ponder on how FAR its maker has come! 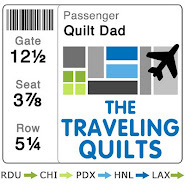 Maybe you should change your name to Super Quilt Dad. The Make Life quilt, but only because I am looking for a simple quilt that will make a statement. All of the quilts are beautiful. i like the make life quilt - it's simple, clean, and beautiful! I love the Make Life...Fresh!! I just love a clean (and yet scrappy) look!! Christmas in the City is gorgeous, John! I like the Make Life...Fresh top. Amazing how you can stretch a few bits of fabric for such an impact! I love Christmas in the City!! And you want to know why?? I too grew up the first part of my life in NYC!! The city that never sleeps :-) How cool is that? Great quilts! My favorite that is a hard choice John! I guess I am going with the downtown loft quilt in the fabulous purples--------------BUT I do really enjoy them all! Hard to pick one...but I do love the purple/teal/aqua Christmas in the City the best. You've done it again, John. Creative Genius that you are. love love LOVE the "japanese" feel of the third top!! It plays tricks on my eyes too! I love the bold colors and strong contrast of the last quilt. Although, I think I need to get my hands on some of that grunge fabric! Thanks for the chance! All the quilts are beautiful but the Olympus line Japanese quilt is my favorite. All your quilts are beautiful--and it's hard for me to decide between the Sweetwater one and the Christmas in the City!! I like the Deer Valley/Pineapple Blossoms quilt. Thanks for the giveaway! Defenitely Christmas in the City!! The quilt is so gorgeous and the photo is absolutely beautiful! Love the other quilts as well but that´s my fav! It's a tie between your Christmas in the City quilt and the Pear Tree quilt. Love both! Congratulations on the new book, I had the chance to browse it and I love the projects. My favourite quilt is the second one. My favorite is the Olympus with the block you designed for Quiltmakers 100 Blocks. Wonderful quilts as ususal! I've been drawn to the design of the last quilt you posted ever since you made it as a mug rug. (was it called Ziggity??) 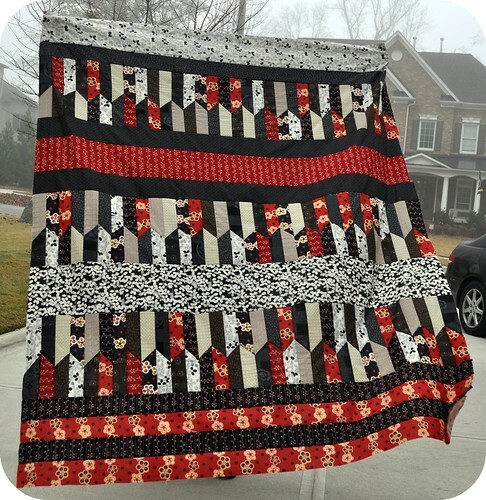 Your quilt version is gorgeous with the reds and blacks and greys. Another hit! My favorite is the Make Life...Fresh quilt. It reminds me of a stretched star. Thanks for participating in the tour and the giveaway. I like the quilt you made with your quiltmaker's block - red and black is always such a bold and graphic combo. I LOVE your Deer Valley quilt! It's perfection! My favorite is the Pear Tree quilt! All of them are lovely, though! I like the one that looks like little bunting flags. Make Life...Fresh is so refreshing. Love the splashes of color on white. They are all beautiful quilts but I really love the colours in the Habitat one!! Deer Valley Pineapple for me--but it was tough to choose. Thanks for sharing some fabric with us; simply the thought of new fabric makes me happy! My fave is the red & black Olympus quilt -- I love black, red, white, and gray quilts, or any combo of those colours! I enjoy your blog! I like the Make Like...Fresh quilt. A great way to use those smaller scraps of fabric. I love the Make Life Fresh... Again. There is something about its simplicity that's refreshing and it's just so happy! And because I can't figure out how to change my name from "me" it's Meagan b. :). I love the Pear tree quilt, especially the bunting effect. Will have to give this one a try I think. I love the bottom one best, it looks like picket fences to me. I love your Christmas in the City quilts. I lived in NYC for 6 years too and I love the colors you chose to represent it! I like your Make Life Fresh quilt. Very cute. Love that Christmas in the City quilt. Great colors. I like the grunge and the last one. I couldn't find a name. The colors combined with the designs works for me. Busy does not appeal to me, so I need solids to even things out a bit. Perhaps the large border on the grunge balances, and the break up with semi-solids on the last one balance it all for me. I like the Make Life Fresh too, but it was a little taunting, as if it was hiding something. It is just peaking out from behind the squares. My favorite is the last one made with your QM 100 blocks entry. The bold, strong color and lines appeal to me because it is different. Good work! Thanks for the giveaway, though am late visiting. Congratulations on your new book John. That's great news!! All your quilts are gorgeous! If I have to pick, I still can't pick just one. hehe. I'm loving your Pineapple Blossom and the red and black quilt made from your block in Quiltmaker's. Thanks for sharing your quilts with us on Sally's hop. Thanks for your giveaway and a chance to win. I am loving the Christmas quilt! I think adding new colors to the traditional green and red spices up the holidays and makes it appropriate for more than just the holiday season! Thanks for sharing! I really like your quiltmaker 100 block quilt- I think its because of the graphic lines and bold colors or maybe because of the Japanese fabrics. It is a wonderful quilt John. Thanks for sharing the terrific quilts. Congratulations on the new book Too. I especially like the quilt with the Pear Tree fabrics. Great way to make a little bit of print fabric have a big impact. I like the red and black quilt. I didn't see a name, but I think you said it was with your 100 blocks submission. It has a very clean line to it. My husband would love something like that. Those are distinctive quilts. Love the non-traditional Christmas especially. 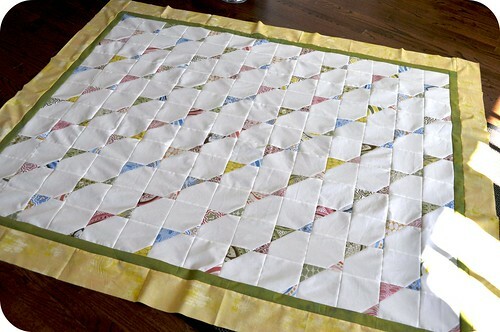 I like the pear tree quilt - it looks clean, fresh and easy to make. Hope you are staying warm - thanks. Congratulations on the book. I live in Boston but I agree there's nothing like NYC at Christmastime! All the quilt tops are fabulous, but my favourite is the Quiltmaker Olympus Quilt. I have a stack of red and black prints that I have collected over the years and I think this just might be the way to use them. Thanks! I really like the colors in the second quilt but was struck by the bold colors and designs in the last one. I love the Christmas in the city quilt. It makes me want to curl up underneath it beside my Christmas tree and watch the snow fall. So cozy! My favourite quilt is the Make Life Fresh. It just looks fresh and modern. I love the quilt with the Olympus fabrics--the one you called more 'oriental' in design. Very masculine, very cool! I love the Make Life Fresh quilt....great name, calm quilt, and terrific use of fabrics! My favorite is the Make Life Fresh quilt -- so unfussy looking! I really like "Make life fresh". it is a great way to use up scraps and make them go as far as possible.......wouldn't this be cute with a red backgound and use up all those christmas scraps?